You may not be comfortable with how exactly to define the quasi country, quasi-rock music that comes out of the Texas / Oklahoma region known as Red Dirt, but what you can be confident in is that it would never have come to life like it did without a man named Tom Skinner. Along with Jimmy LaFave and the late Bob Childers, Tom Skinnner was one of the founding fathers of the music nicknamed for the clay-laced earth deposited throughout the region that gives the Red River dividing Texas and Oklahoma a burnt red hue. More of an attitude than a sound, the term “Red Dirt” encompasses the rock music of Cody Canada and the hard country of Jason Boland all the same. The only constant is they all got their start in Stillwater, Oklahoma, under the tutelage of Tom Skinner and others. But it wasn’t just his shepherding of younger artists that made him so loved and revered throughout the Red Dirt music world. Most of all it was his songwriting. It would be hard to call Tom Skinner prolific, but that was only because his songs meant so much to himself and the intimate crowds that he shared them with that he never put too much effort into being a big recording star. It was how his songs touched and inspired the artists around him that was his most lasting gift. Skinner was coaxed into recording a self-titled album with the Mike McClure Band in 2012 that impressed another notable Stillwater resident, Garth Brooks, who looked up to Tom Skinner so much, he once begged to be in Skinner’s band before he hit it big. Skinner recorded some albums earlier in his career, but decided it wasn’t for him and he was simply going to play live. In Stillwater, and beyond, he was a pillar of the music scene. A Oklahoma State Alumni, and an inductee into the Oklahoma Red Dirt Music Hall of Fame, his songs were covered by many Red Dirt artists, including Cody Canada, Stony LaRue, the Red Dirt Rangers, and many more. 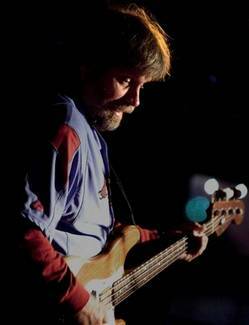 Bass player, songwriter, and father of Red Dirt music Tom Skinner passed away Sunday evening, July 12th after a long bout with health issues. He was 61-years-old. He will leave a hole in the Texas / Red Dirt music scene the size of Oklahoma. Rest in peace Tom. You’ll be missed. You were a legend in Red Dirt and your absence will be felt. You were a wonderful friend to my daughter. RIP Tom! I was privileged to hear your songs and shake your hand! RIP! You will be missed. Rest in I Peace! You will be missed by so many. An amazing songwriter and will be missed very much, very sad day in Oklahoma. RIP Tom. It was an honor each time I got to meet you. You will be missed but you will live forever in our ears and hearts with your music. Based on the video above, it’s obvious that he was a very talented songwriter. Very sad that he died so young. May he rest in peace. It was a privilege to have served with you at Travis AFB and listen to your music. This man was a legend and he will be missed. Tom had the faith of a Blind Man. RIP, Tom. I used to sing wth the Skinner Bros for a short time back in the Stillwater days. I can remember sitting in the student union w Tom as he talked me into singing a few songs w him. It was the beginning of the most fun year of my life! You couldn’t meet a bunch of more fun, silly and magically talented guys than these. RIP Tom, you will certainly be missed. His family, friends, classmates and the community of Bristow, Oklahoma will miss this talented man. Rest in Peace Tom. God Speed. Fly High. Tom Skinner has been my friend since the early ’70’s. He was the kindest, most positive, happy person who cared so much about his family, friends, and fans. I remember that year when Kelly sang with the Skinner Brothers….it was indeed a magical year (1982). Tom found so much joy in encouraging young artists to perform because he knew the healing power of music. It gives me some comfort to know he was surrounded by those who loved him in his final hours, hearing them sing the songs, softly playing guitars in the hospital room…..I pray that the music and the love got through to him and gave him the joy and comfort he has given all of us. I am sure he is up there right now tuning up with old friends Bob Childers and Rocky Frisco….. I love you Tom, thanks for your friendship and all the great memories….rock on, and fly high. Please, please. Sweet Tom is no “University of Oklahoma alumni”. A proud Oklahoma State University Alumnus, he definitely was. Not sure how that got twisted around, but I’m seeing now you’re correct it’s been updated. Thanks for the clarification. Wednesday nites at the Colony was so fun w Science Project! Three things we always heard about when we came to Bristow in 1976 – Bob Wills eating at the Hamburger King on Saturday nights, KNOW starting out in the Roland Hotel, and The Skinner Brothers Band! i like the song. Have never heard of him before, but this song reminded me of country comedian Elmer Fudpucker. The voice is similar and the humor is too. All the comments are so true. Its been a long time since I’ve seen the Skinner boys, Dale and Janna. We had great times back in Stillwater and Bristow. I’m still telling the stories. Happy memories. Sympathy to his family.